All games in tagged with "Bionic Commando"
Bionic Commando is a video game franchise consisting of an original arcade game released in 1987, and several later versions and sequels. The original Japanese arcade game and its Famicom counterpart (Hitler's Resurrection) are called Top Secret (Japanese: トップシークレット,, Hepburn: Toppu Shīkuretto?). The original arcade game was advertised in the United States as a sequel to Commando, going as far to refer to the game's main character as Super Joe (the protagonist of Commando) in the promotional brochure, who was originally an unnamed member of a "special commando unit" in the Japanese and World versions. In 1988, Capcom produced a home version for the Nintendo Entertainment System, also titled Bionic Commando, that was drastically different from the original arcade game. An adaptation of Bionic Commando for the Game Boy was released in 1992. A sequel, Bionic Commando: Elite Forces, was released in 1999 for the Game Boy Color. Though it borrows some elements from its predecessors, Elite Forces has a different plot from the rest of the series. Also, the characters (an unnamed male or female commando) have a few more moves, such as the ability to climb down from platforms, and can also utilize a sniper rifle in some segments to eliminate distant enemies. 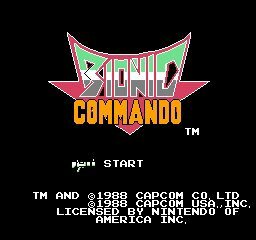 An enhanced remake of the 1988 NES version was developed by Grin and published by Capcom for Microsoft Windows, PlayStation Network, and Xbox Live Arcade and was released on August 13, 2008, under the name, Bionic Commando Rearmed (バイオニック コマンドー マスターD復活計画, Bionic Commando: Master D Resurrection Project in Japan). The remake serves as a prelude to the 2009 video game Bionic Commando. A sequel, Bionic Commando Rearmed 2, was released in February 2011. In all versions of the game, the protagonist of the game is Nathan "Rad" Spencer, a commando equipped with a bionic arm featuring a grappling gun, allowing him to pull himself forward or swing from the ceiling. The series is notable for being one of few instances of a platform game in which the player cannot jump. To cross gaps or climb ledges, the hero must use his bionic arm. This was the first game to feature a grappling gun/hook, which later appeared in games such as Earthworm Jim and Tomb Raider.